By now, chances are you have seen several of our members posting in the Forum that they have seen random Technic sets at a few Walmarts. On Walmart's website, all of last years line of Lego Technic are listed as "Out of Stock", but "Coming Soon" (you can see this here). Target's website actually allows to purchase any of last year's Technic sets (assuming they ship). Furthermore, if the fall of Toys R Us as a retailer does come to pass in the next several years, one would assume that this line would end up getting picked up by most of the other retailers - or at least Amazon. It remains to be seen whether any of these retailers would start carrying them in B&M stores, but either way they are going to be available to more people. So is this a good thing for Technic as an investment? For the people that end up purchasing Technic sets after they are gone, we would have to wonder why they do it. Did they just never see that set? Do they not have a Toys R Us near them? Were they too young? Chances are, most of this comes from people that like the theme and just missed the boat - or furthermore got into the theme after the set came out. Really this is just like an other theme. The difference is, Technic has a much more "cult" following. It is definitely not for everyone and is extremely challenging really appealing more to AFOLs. One could argue that the majority of people who would be into Lego Technic already are, and branching it out is not going to gain a ton more fans or really do a whole lot else for the theme. On the other hand, it could just be that Technic is very unknown at this stage; getting it out there could really fuel the fire for this theme to get going. Before long, it could become one of the best investment themes. Let's take a look at some of the pros and cons of this. Especially if Technic starts getting carried inside the B&M stores, these sets will be seen by many more people. Looking back, I think Lego Technic has made unbelievable steps forward in design and detail in the last several years. The sets are so much more real looking than they were just several years ago and with the adding of power functions to a good majority of the sets, they are beginning to appeal to a much wider audience. A bigger audience can't be bad right? Chances to buy these at bigger discounts. Where do most of us get our Technic? Amazon UK. We definitely get some good discounts, but we have to deal with damaged boxes, items not showing up, and the massive wait to just get them at our door. If Amazon US is giving us these deals, we won't have to worry about shipping. They will be at our door in two days. We also wont have to order 5 sets to get the best deal either. Clearance Technic: If these hit big brand retailers, this means we have a shot of getting these on clearance at some points. Toys R Us really never clearances anything Lego, and when they do it equates to what should have been the retail price. Though this wouldn't have an insanely large affect on the investment of the brand (other than 1000s of the same set being clearnaced), this would at least give us the chance to get these at a sweet price and score an awesome Technic set for peanuts every once in a while. Technic flipping during the holidays: One thing that seems to commence every year during the holidays; Out of stock sets. We see one set go out of stock, then the price soars and everyone runs around like a chicken with its head cut off trying to find more of them. This year, that set was really the Dolphin Cruiser. I made some really good money flipping several of those. A lot of the Amazon sellers made a pretty penny running around grabbing up Architecture sets from Barnes and Noble. Why couldn't we get in on the fun with one more brand? The Technic Quad 9392 and the Crane 9391 both dried up very early in the Christmas season this year and the prices for both about doubled. Unfortunately, I only had one TRU which I cleaned out immediately. However, I have 6 Walmarts and 4 Targets within close vicinity so things could have been different. There are definitely some notable positives to having this brand around more. This is an "underground" theme for a reason: Technic is not for everyone. You can argue Disney Princess, or Friends, or Ninjago is not for everyone as well - but Technic requires a certain ability building-wise. It isn't an entry-level Lego theme. So it may not attract as many casual fans. A lot of people would see these sets in stores like Walmart or Target, but they may not buy them, or at least continue to buy them, because putting them together is really more work than fun in a lot of cases. More stores = more sets. This means more and more will be sold. If the supply goes to the point where it is over the demand, the secondary market starts to go buy-buy. Maybe all the people that currently pay secondary market prices for Technic are people that never really knew a certain set existed. They end up reading about it or seeing a picture and then pay double for it. That wont happen anymore if you can walk straight into a Walmart and find any set you want. More discounts = less secondary growth? 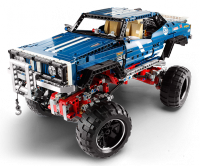 Its very possible that Technic sets grow as well as they do because you can't buy them at steep discounts. Lets say you are looking to buy 42009, the MKII Crane. It's retail is $220. Toys R Us has a sale and it gets to $200. You purchase 2 and call it a day. On the flip-side, Amazon US has a deal and sells these for $140 - you buy 5. The more sets bought, the more the investment value could go down. You are getting them at bigger discounts, but if that supply starts to go over the demand line you are still in the same place. Why mess up a good thing? Technic sets in general average just above a 9% CAGR. However, the theme has been around for a very long time meaning a lot of sets stopped appreciating a long time ago and are still averaged into that number. In fact, Technic sets in the last 5 years have supported extremely great ROIs provided you followed the better sets like Cranes, Service trucks, and Motor cycles. A lot of us make good money off Lego Technic already - why would we want to take a chance and have it screwed up? Furthermore, we are the only ones getting the big discounts because the average person most likely doesn't know they can get these off Amazon UK. I definitely see both sides of the argument. Obviously none of us reading this, or me writing it, can really make the decision ourselves. We can hope one way or another though. I honestly hope they do come to stores like Walmart and target. First off, there are already enough themes that are profitable in the Lego brand that having one possibly going by the wayside isn't going to kill us. Yes, it will somewhat stink if that happens, but we have a lot of other themes at the moment we can focus on. I think it is worth the chance because of what Technic COULD become if it does. I see the whole situation in a very positive light. I have a Technic set, 42004 Back-loader, on my desk at work. I have it next to an Xwing, a few planet sets, the mini-VW bus and the Creator Prehistoric Hunter. Everyone that comes in notices the Technic set first. They love the moving parts, think it looks extremely real, and most are surprised it is actually Legos when I tell them. I think there is a lot of untapped market out there for Technic. People that love vehicles have always been attracted to Lego because of how well they replicate them and this theme is the pinnacle of that. However, there is another reason this could really be big: Licensing. Right now, we have the Unimog - licensed by Mercedes and because of that, a lot of us think what is somewhat of an ugly vehicle will be a big time seller. Why couldn't Lego expand this with a bigger audience? Can you imagine a John Deere Tractor? NASCAR themed Technic Racecars with power functions and remote controls? The possibilities are really endless. I have commented before that in Alabama, Lego is not huge because the majority of people down here love Guns, Football, and Farming/sports vehicles. If Lego taps into these well known licenses, Alabama would be a gold mine. I can imagine a Jimmie Johnson Car replica Technic set selling for 4 or 5 times retail after it retires to the same people that have 50 of the same model cars throughout their house down here. Does spreading the theme out mean this will happen? No. But at the moment, if these sets do spread out everywhere it will possibly make Lego invest more money into them. They will start thinking of more licensing options with the wider availability. If they do, we could have on our hands one of the best themes ever in terms of pulling in new Lego fans that were never interested before. Maybe its a dream world, and its definitely just speculation. But I don't think many can argue that more fans of Lego means more money in all of our pockets. I noticed a 42010 at a local Meijer store here in metro Detroit today. It was the only Technic model they had and they only had two of them in stock. I go to this particular store fairly often and have never seen them stock a Technic set before. With the exception of some Star Wars sets, the CUUSOO Mars rover and Hayabusa, Technic is the only LEGO line that really interests me (from a building standpoint). As far as investing goes, they're all fair game! Technic has been around for a long time, miss the old "mini"figs. i have bought many sets through the years and always managed a really good return, average 70% PROFIT within a year and a half or so. Youre forgetting that kids turn into adults on a daily basis and todays young are much smarter than us older folk. thats whom this theme is aimed at, them hipsters.